Pocket Heat For Feet, Gloves & Boots. Does the job of keeping your hands warm. They last a long time and you don't have to bother re- heating them in microwave as with some other brands that are on sale. Keep them in my pockets when working and in gloves when out. On blood thinners so feel the cold badly so these warmers are brilliant. This is a wonderful warm and helpful product for the cold . Buy it and see . Becoming older one soon feels the cold . More so if you have white finger , and many do today .. So I was looking for some kind of warmth besides gloves .. This product is first class .nothing so easy to use , you just open the packet , and that's it ..I find it lasts for 12hrs .without any attention .. What's the name of this little wonder . It's called Warm Hands .. Buy and find out for your selfs . I promise you will not be disappointed .. Tried these hand warmer at a football match, opened them and put in my gloves at the start of match, bit disappointed that they seem to take about 45min to get warm, but where great when completely warmed up, and lasted for a very long time, think you need to activate them well before your hands get cold. But saying that would still recommend this item. Great heat and they last ages!! I used the hand warmers while camping in windy, cold Aviemore. I have Raynaud's but put them in my pockets during the day and they kept my hands nice and toasty all day. It was only five degrees during the night and I was struggling to sleep so I put a few hand warmers inside my clothing. I warmed up in no time and then I fell asleep really quickly and was still warm and cosy when I woke up. I'll be buying these again, definitely!!! I'm impressed!!! 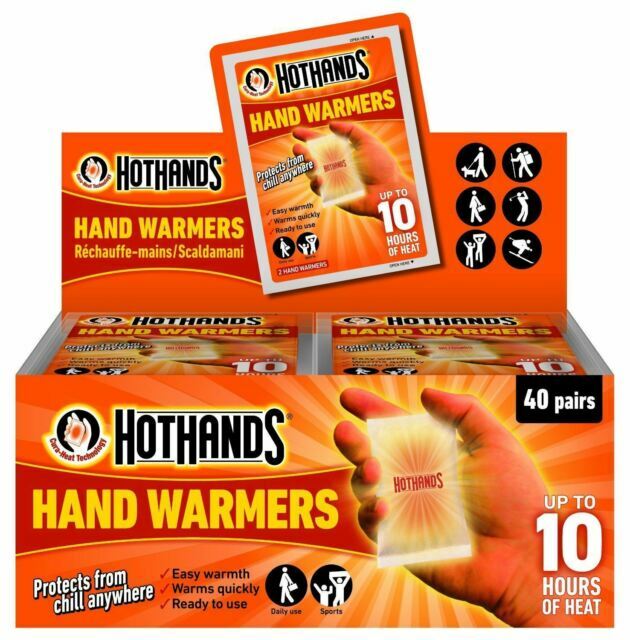 Obviously I've not tried this product because it is still summer however, I used these hand warmers all through last winter and once you've tried them you will never be without them. Where others are freezing cold around you there is not a better feeling than feeling warm. These are great for those who work outside or exposed to the elements for a long time. Just open the bag and pop out the hand warmers, shake them and within 5 minutes they are getting warm. You will not believe how hot they get, not too hot but I would say just right. You will also be surprised how long they stay warm, they will definitely last you all day, they are not joking when they say 10 hours. This will be the best purchase you will have made this winter.